Avalokiteshvara (Tib. 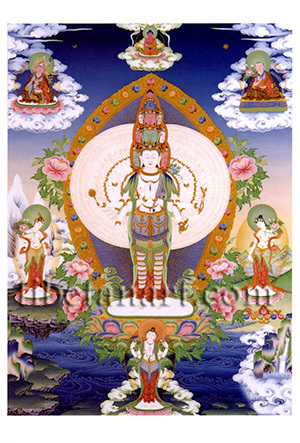 Chenrezig) with a thousand hands and a thousand eyes is also known as Mahakarunika, the 'great compassionate one'. He is white in colour, adorned with the five divine silk and eight jewel ornaments, and he stands upon a moon disc and a lotus. His eleven faces are arranged into three tiers, each with three white, red, and green faces. Above these nine faces is a wrathful blue face, and at the top is the crowning face of red Amitabha Buddha. A deerskin is draped over Avalokiteshvara's left shoulder, and his two principal hands are palms-folded in front of his heart. The other six of his eight principal hands hold a crystal rosary, make the gesture of generosity, and hold an eight-spoke golden wheel on his right; while his other three left hands hold an eight-petal lotus, a golden water pot, and a bow and arrow. Extending outwards from his body are his remaining 992 arms, which form a series of six concentric circles containing 32, 144, 168, 192, 216 and 240 hands respectively. Each hand has an eye in the centre of its palm, symbolizing the union of his five 'method' perfections (five fingers) with the sixth perfection of wisdom (eye). Above him is Amitabha Buddha - the 'Lord of the Lotus Family', and in the upper left and right corners are Padmasambhava and the Tibetan Khadampa lama Dromtonpa. At the bottom centre is the four-armed form of Six-syllable Sadaksara Lokeshvara, who embodies the six syllables of Lokeshvara's famous mantra, Om Mani Padme Hum. On Lokeshvara's right is his attendant male bodhisattva Manidhara, the 'gem holder'; and on his left is his attendant female bodhisattva Sadaksari, the 'six-syllable lady'.